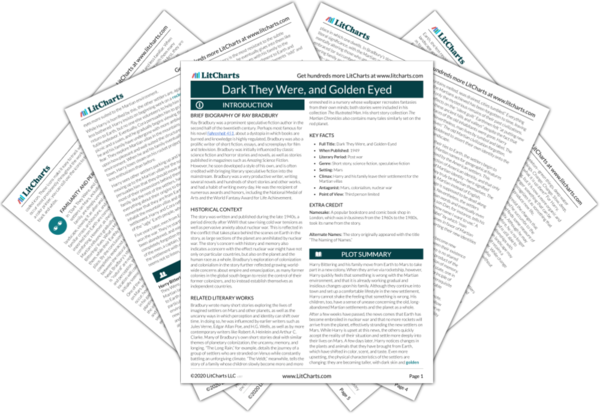 Instant downloads of all 942 LitChart PDFs (including Dark They Were, and Golden Eyed). Welcome to the LitCharts study guide on Ray Bradbury's Dark They Were, and Golden Eyed. Created by the original team behind SparkNotes, LitCharts are the world's best literature guides. A concise biography of Ray Bradbury plus historical and literary context for Dark They Were, and Golden Eyed. A quick-reference summary: Dark They Were, and Golden Eyed on a single page. In-depth summary and analysis of every of Dark They Were, and Golden Eyed. Visual theme-tracking, too. Explanations, analysis, and visualizations of Dark They Were, and Golden Eyed's themes. 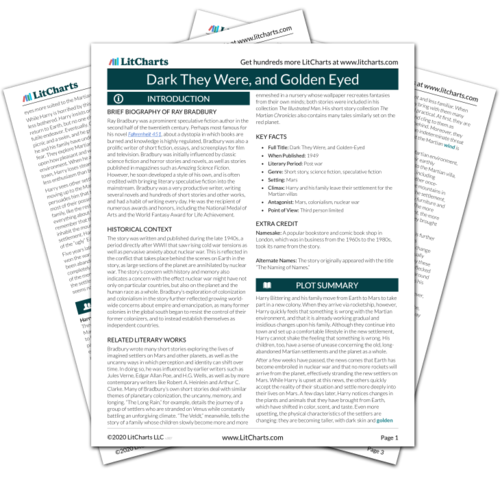 Dark They Were, and Golden Eyed's important quotes, sortable by theme, character, or . Description, analysis, and timelines for Dark They Were, and Golden Eyed's characters. Explanations of Dark They Were, and Golden Eyed's symbols, and tracking of where they appear. An interactive data visualization of Dark They Were, and Golden Eyed's plot and themes. Ray Bradbury was a prominent speculative fiction author in the second half of the twentieth century. Perhaps most famous for his novel Fahrenheit 451, about a dystopia in which books are burned and knowledge is highly regulated, Bradbury was also a prolific writer of short fiction, essays, and screenplays for film and television. Bradbury was initially influenced by classic science fiction and horror stories and novels, as well as stories published in magazines such as Amazing Science Fiction. However, he soon developed a style of his own, and is often credited with bringing literary speculative fiction into the mainstream. Bradbury was a very productive writer, writing several novels and hundreds of short stories and other works, and had a habit of writing every day. He was the recipient of numerous awards and honors, including the National Medal of Arts and the World Fantasy Award for Life Achievement. 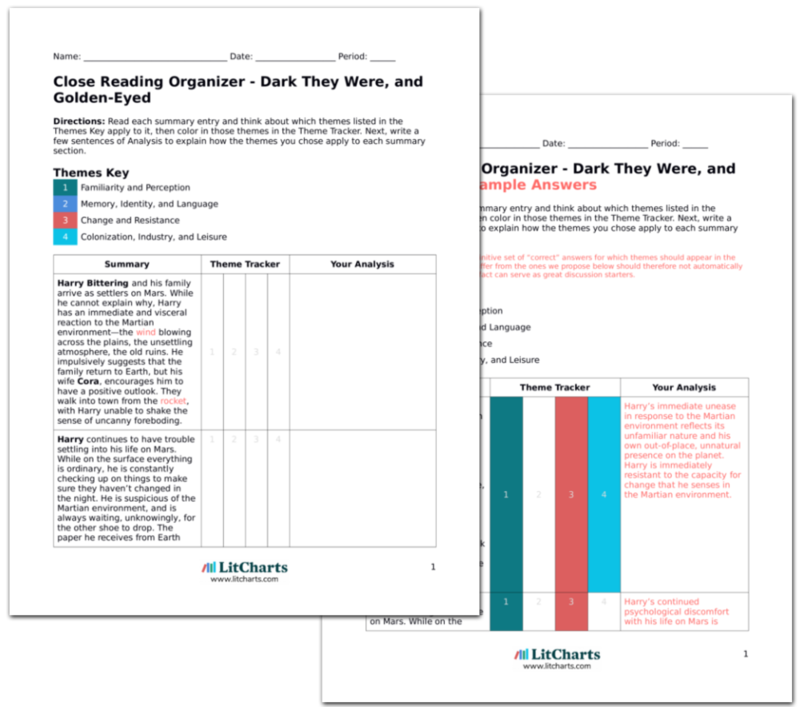 Get the entire Dark They Were, and Golden Eyed LitChart as a printable PDF. The story was written and published during the late 1940s, a period directly after WWII that saw rising cold war tensions as well as pervasive anxiety about nuclear war. This is reflected in the conflict that takes place behind the scenes on Earth in the story, as large sections of the planet are annihilated by nuclear war. The story’s concern with history and memory also indicates a concern with the effect nuclear war might have not only on particular countries, but also on the planet and the human race as a whole. Bradbury’s exploration of colonization and colonialism in the story further reflected growing world-wide concerns about empire and emancipation, as many former colonies in the global south began to resist the control of their former colonizers, and to instead establish themselves as independent countries. Bradbury wrote many short stories exploring the lives of imagined settlers on Mars and other planets, as well as the uncanny ways in which perception and identity can shift over time. In doing so, he was influenced by earlier writers such as Jules Verne, Edgar Allan Poe, and H.G. Wells, as well as by more contemporary writers like Robert A. Heinlein and Arthur C. Clarke. Many of Bradbury’s own short stories deal with similar themes of planetary colonization, the uncanny, memory, and longing. “The Long Rain,” for example, details the journey of a group of settlers who are stranded on Venus while constantly battling an unforgiving climate. “The Veldt,” meanwhile, tells the story of a family whose children slowly become more and more enmeshed in a nursery whose wallpaper recreates fantasies from their own minds; both stories were included in his collection The Illustrated Man. His short story collection The Martian Chronicles also contains many tales similarly set on the red planet. Namesake: A popular bookstore and comic book shop in London, which was in business from the 1960s to the 1980s, took its name from the story. Wack, Margaret. "Dark They Were, and Golden Eyed." LitCharts. LitCharts LLC, 2 Feb 2019. Web. 21 Apr 2019. Wack, Margaret. "Dark They Were, and Golden Eyed." LitCharts LLC, February 2, 2019. Retrieved April 21, 2019. https://www.litcharts.com/lit/dark-they-were-and-golden-eyed.